Everyone loves free stuff, right? In this article we have put together a collection of some of the best free WordPress themes that are suitable for one page websites. One page websites have been increasingly common in recent times mostly because of mobile devices. The number of people accessing the internet via portable devices is growing all over the world. One page websites offer an easy to use and enjoyable experience for visitors using mobile devices instead of having to navigate a multipage website. Another reason for one page websites is for those who only want to publish a little bit of information. Instead of creating a website with multiple pages with only a few lines of text, why not condense everything into a single page. This avoids unnecessary navigation and also prevents your website from looking scant and empty. With one page websites the developer can also control the flow information and focus the user’s attention on relevant pieces of content. Since the popularity of one page websites are increasing, WordPress themes for them are also growing. WordPress is the most popular content management system (CMS) on the internet today with thousands of large and small websites (28% of the internet) powered by WordPress. Having a theme makes it easier for you to develop a WordPress site without hiring a developer for new users and without starting from scratch for professional developers. One page WordPress themes provide a simple way to get the work done and get your site up today. If you are searching for a free one page WordPress theme you are in the right place. If you are not cheapskate like most of us, then make sure to check out our list of best premium themes. Anyways take a moment to look at our free themes collection and you will surely find one or two to download and use on your next project. Looking for a theme for your business? West is the way for you to go. West provides everything you need to create an amazing website for your company for free. Its one page layout is stunning and beautifully made, it is totally responsive too so it looks great on all devices. Live Composer integration is one of its unique features that allows you to create your website in minutes. The custom header function lets you showcase what your company is all about while the full width header image can be customized to impress all visitors to your website. Other features include options for colours, fonts, header area, and blog related things. Speaking of blogs, you can create a full blog for you website. This allows you to engage your visitors with great content and also improve search rankings. Tired of free WordPress themes with designs that all look the same? One page express offers unparalleled customizability on the level of premium themes. It has lots of customization options like video background, slideshow background, header content types etc. The drag and drop builder developers to create websites in just minutes. The video and slideshow background can be used to display a variety of items like your products or services, content about your website or maybe a short bio to give your website a modern look. The amazing thing about One Page Express is that every element is responsive, so your website looks great right out of the box. With its live content editing, customization is above several free themes in this aspect allowing you to edit, change or remove images, customize layout and add or remove content. One Page Express features predefined designs for both header and content areas and over 30 content blocks to choose from when arranging your site. Apart from the level of customization these allows you, it lets you build a beautiful website in just minutes. It even has a comments section for you to be able to interact with your website visitors. Essentially with One Page Express you can create a website that looks like no other which is unusual with free WordPress themes, download it now. Parallax one is modern and simple theme for your business needs. With a large image header, customers are immediately immersed in what visual content you place there. It is great for immediate brand information or promotions you want to display. The smooth parallax scrolling ensures your users remain engaged as they use your website. It has several rows for things like testimonials, portfolios, team profiles, Google Maps. This theme also has a contact area so your customers can always stay in touch. With its localization options, it ensures no one is left out no matter their language. Llorix is a designed to be a single page theme but you already knew that. However this means that it simple, easy to handle, and easier to organize. This simple and beautiful theme offers localization options which ensures visitors from all over the world can enjoy your website. Search Engine Optimization (SEO) is easy to do with one page websites and is no different with this WordPress theme. Llorix One offers a special feature which is customizable ribbon which you use for whatever. You can use to send a personal message, brand your website, or highlight a certain thing to your website visitors. The parallax scrolling in this theme is smooth and sleek. When navigating the site the content slide beautifully and gives the feeling that it is floating. The makers of this WordPress theme, ThemeIsle has it all figured out by including everything you need in one page theme. The testimonial section lets you display comments from your satisfied customers so that you can get new ones. Most themes need an external plugin to display your latest posts and articles but Llorix One comes prepackaged with that functionality. Your website visitors can view the brains behind your business by viewing your amazing team with their pictures and social media links. Never mind social media links for your team, Llorix One has social media links at the top of your website for your business as well and a wonderful contact section for potential customers to reach anytime. This one page WordPress theme can be used for many kinds of websites. So if you want to create a portfolio, business, product showcase, freelancer or any other website, you should download OnePress. Those who appreciate good design would definitely like this theme meanwhile the theme is totally responsive so it won’t matter if your people are accessing your website via a computer, phone or tablet. As with most WordPress themes, you do not need any coding skills to use OnePress. The theme is totally compatible with WooCommerce and you setup an online store for your goods easily with this theme. Custom content blocks allow you create pages that with your company info, videos, gallery, clients and services while the custom menu delivers breathtaking navigation for your website. Upload whatever high resolution image that you to like to the large custom header and personalize the theme by uploading your logo at the top. One other custom content block is the latest posts from your blog which you can place on your homepage. The latest posts is displayed with featured images which encourages people to read them and promote your site even more. Engage people by adding a threaded comments section to the bottom of each blog post, people can therefore interact with themselves and you on the comments section. In essence this theme a simply elegant package considering its features all for free. Have you ever seen a free WordPress theme that looks like a premium theme? If no, then you haven’t used Talon. Talon is overall beautiful and sleek theme with plenty of useful features. To begin with, one of its features is the header which has slider or static image options for you to choose from or you can remove it totally. It has a great page builder which has drag and drop features and combines nicely with the live customizer for you to see your changes in real time. If you want to include a blog on your website, its multiple blog layouts would please you. Talon comes with a large number of icons for you to choose from, however, if you still need more you can easily load another pack from a CDN of your choice. Access to Google fonts comes by the default with the theme which you can easily select from the customizer. This free WordPress theme has a widgetized footer with 3 widget areas with options to use only one or two of them; what this simply means is that the footer area is controlled by the widget area in the wordpress backend. This theme does not limit you to use a single language by being fully translation ready, so even if people who do not understand your language land on your page, they can still enjoy your website. Meanwhile the theme options like colours, fonts and more can all managed from the admin panel which ensures seamless workflow. With these and many more you should definitely give Talon a try. A simple and professional theme, Allegiant is a one page theme that is good for agencies and business websites. It is one of the best WordPress themes you can use for a business website with its neutral design and flexibility. Allegiant is compatible with many popular WordPress plugins like Yoast SEO, WPML, Contact form 7 and WooCommerce. The WooCommerce integration allows you to sell your services or products directly from your homepage so you can make money for all the work you put in. This theme even has plugin of its own called CPO Content Types. The plugin is a companion plugin for the theme that provides you with all the nice one page content modules to use you don’t spend lots of time trying to build the homepage from scratch. The one page layout includes a services section for you to show people what you can offer and also a team section to showcase the brains behind the business. Of course Allegiant is totally responsive as expected for any good WordPress theme in 2017. Allegiant has a full width template design but with its complete layout control you can choose to add a sidebar with widgets. Its customization options are many to make the website truly your own, by giving you freedom to add a custom background for your site with other options like custom menus and featured images. Translation tools in this theme makes sure your site isn’t limited to one language and threaded comments for your blog posts always keep visitors interacting. Awe is a good option for a business WordPress theme that consists of only one page. With its completely responsive design, this free theme allows you create beautiful and good looking websites. The search engine optimization of this theme is very good so people have no trouble finding your site. You build the homepage of this theme with its Section Sortable feature. This also you to place any of the premade sections anywhere in the design which gives the theme unprecedented flexibility and customizability. The sortable sections include Parallax Image Background, YouTube / Vimeo videos, about us information, team section, services section, portfolio items and core features. Therefore you can place any of the sections anywhere you like, for example you can start with video header or showcase your product features at the beginning of your website. The theme options of Awe include logo upload and colour customization makes this theme easy to set up. Also integration with Contact Form 7 plugin and Google Maps ensures your customers can stay in touch and easily find your physical location. Cuda like its name is a colourful and exciting theme and like other themes on this list, it’s totally free. This theme has bright one page layout and is filled with cool features. One of those features is its slider section where you can choose either a static or dynamic slider. You can even add buttons to the slider to direct and send people to wherever you want them to go. Other features are unlimited colour options and two menu bars for your use. For the two menu bars, you can use one style for the homepage while using a different one for inner pages like a blog. Cuda’s customization options allow you to remove any section you don’t want on its single page. Sections for your team members who keep the business moving or services you can offer can be added or removed. A gorgeous counter is also available to be used in your design of your site. Navigation on a Cuda website is sleek because it has smooth scroll. Wow your visitors with fast page speed load times with its lazy loading capability. This makes sure some of your website content displays immediately anyone clicks your link. Contact Form 7 is also included in the theme. MageeWP, the makers of this free WordPress theme have created a sophisticated and elegant theme for personal and corporate websites. All relevant information are displayed all on one page. One Tone has 15 built-in sections which can arranged in any order you like. Some of the sections that have been built for you include services, gallery, about, clients, recent posts etc. Easily create awesome websites with its 6 customizable patterns. 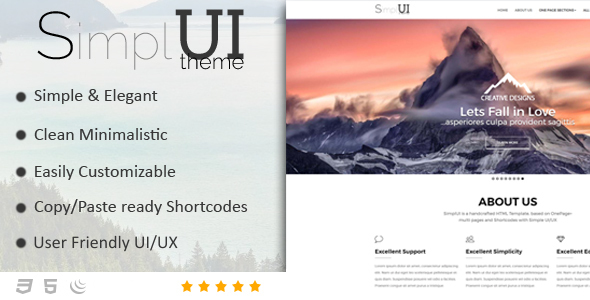 The customizability extent of this theme allows you to add unlimited sections to the homepage via its powerful theme options. Make this theme truly yours by selecting any of its 60+ well designed shortcodes to create a personalized website. One Tone has 3 header styles to select from which are the standard WordPress header, transparent header and sticky header. You can combine this with any banner styles, whether you choose its parallax scrolling background, video background or a simple slider. All these options provide so many design possibilities which prevents your website from looking like a generic WordPress theme. This theme is not only easy to use for you, the WordPress developer but also for your website visitors with its side navigation. The side navigation option enables your users to easily jump from one section to another without having to scroll for miles. This theme is a free multipurpose one page WordPress theme. Himalayas can be used for business, agency, freelancer portfolio, photography and almost any kind of website you have up your sleeve. All your one page theme needs are satisfied with this theme which is what makes it one of the popular ones out there with over 7000 installs. The theme has an image slider which supports high resolution pictures. Hence you can upload any picture to display relevant content beautifully. From its colour options select any colour that fits your brand and have it reflected all over the site in menus, links, buttons etc. Its WooCommerce plugin compatibility is well put together. Just install the plugin, add a payment processing and start making money right away. Himalayas has a clean parallax design which calls attention to your stunning website immediately. Awe is fully translation ready so you website can be read by visitors from any part of the world. The theme uses widgets to make building and customizing the website easy. Some widgets available are the services widget which highlights what you can offer, a portfolio widget to display work you have done in the past, call to action widget to direct your users to the important parts of your page and a contact widget so your customers can contact you quickly and securely. There’s an option to expand from the one page by adding a few blog pages to your website. You should definitely try Himalayas. One Page is professionally crafted for business websites. This is theme focuses on all the content on your website. The simple design makes sure your information is prominent and users can find what they need easily. Its clean design is simply outstanding and stunning for a one page site. It is loaded with all the features you need for any business website with many useful elements. Its built in sections are perfect for any size of businesses. Sections like services, blog, portfolio, testimonial, pricing, team, video and others makes anything you need for business website available. You can place and arrange the sections in any order you like and remove any you feel you do not need. The slider options of this theme are numerous with options like customizing the slider’s colour, text, link and images. Five sliders are come with One Page that you can use on your site with special horizontal and vertical transition effects. The colour customizer of this theme is so powerful, you can change the background colour of any of the sections in the theme and even select an overlay colour for the slider. All to make sure your final WordPress website looks bright and beautiful. Built with cutting edge technologies, this free WordPress theme was developed with Bootstrap, Joomla 3, HTML, and Expose 3 framework. The one page design of Switch is made with converting visitors to customers in mind. Present your images beautifully with the integrated Revolution Slider to present your important information form. The menu is always visible with the sticky navigation bar, no matter how far any visitor has scrolled. You can also proudly display your product features or services with well-made layout for this section. All your team members can be displayed proudly with their beautiful pictures and social media links. You can proudly showcase testimonials from your many satisfied customers. This free business theme comes with a portfolio gallery so the world can see all your good work with the cool design. Whatever reason your clients need to contact you they can do so with the stunning contact form at the end of this one page theme. The contact form also includes Google Maps for clients to find your brick and mortar location easily. This theme has a creative and professional design with a wide array of tools for promoting your business. To begin, it has a front page builder that combines a broad spectrum of drag and drop elements. You don’t even have to worry about hitting the Preview button every time you’d like to see a little change you made. The front page builder is recommended for both beginners and advanced users. The entire design interface exists on the frontend, which is not necessarily a game-changing achievement, but it’s cool that it’s free to use. The entire BeOnePage theme is easy to navigate, ensuring easy access for phone and tablet users to read your content. Parallax images are scattered throughout the one page theme, creating a sense that your company has a creative side to it. Combining this with the AJAX portfolio and you have a fantastic page for presenting your previous work. With an unlimited number of fonts and colours available with the theme, creating near-limitless ways for propelling your branding strategy to new heights. Frequent updates and friendly support come along with the theme if you upgrade to the paid version. It’s awesome to know that you can pay for a premium option because you simply want to test out the free one and upgrade when you think it’s right. Not many free themes look like this, with a stunning header that covers up the majority of the screen. Overlaying text and buttons are included for calls to action, while a full blog boosts your search engine rankings and show people that you are willing to give away free content. You can reveal your services with icons and columns, and include testimonials in one of the abundant one page content rows. The theme has a filterable portfolio, and you can sell items and quickly create a contact page. If you’re interested in getting a site up and running fast, while also having the option for a premium upgrade, the BeOnePage theme is certainly a great option for you. Integral is a powerful one page business theme for professionals, agencies, photography sites and businesses, using parallax effects to grab attention with some sleek icons and featured images for a full portfolio, its strength lies in displaying content on a single page in a simple and graceful manner. It’s really easy to customize and allows you to create a stunning website in seconds. It boasts of a rich colour scheme with light and dark sections accented with blue, green and red. It comes with a well detailed administrative panel and has great potential for expansion. With state of the art translation tools, you can switch your text to different languages, while the threaded comments get your customers chatting with each other after a blog post. Along with custom menus, RTL language support, and sticky posts, the Integral theme was designed to please. The end result is a simple, elegant, yet professional website which does a good job of removing as much interference as possible, focusing the user’s attention to the most important content. Did we mention that it’s free? The Gaga Lite theme boasts of a built-in customizer which you can easily use in building your website. Once again, it’s a free one page option, and it includes responsive modules for easy navigation on mobile tablets and phones. The theme has the option for a multiple header layout, full screen slider, team layout, services layout, skills layout (counter), portfolio layout, client layout, testimonial layout, pricing table, blog layout, call to action, footer layout etc. The fullscreen slider is one of the standout features, because it helps you feature your promotions or talk about upcoming events. The powerful typography selection is a plus, and the sticky menu is something that one page websites should have, since people can easily get lost if they scroll down too far. The detailed homepage provides various modules for you to talk about your team, your company, what people are saying about your business and more. Incorporate a blog to give away free content, and create a full portfolio for featuring some of your best jobs in the past. The full screen slider has overlaying text, which is nice for explaining what it is your company does, or to explain a new product. The theme is also SEO friendly. Gaga Lite is the multipurpose WordPress Theme that helps you create a beautiful website in no time. Onetake is a quite outstanding free one page WordPress full screen theme. If you enjoy clean and modern templates, the Onetake theme is definitely one of interest, because it offers a large header area with overlaying text and buttons, which are all tailored to improve your conversions. The theme is beautifully designed with HTML5 & CSS3 and is based on Bootstrap. It is built to keep all your content on the homepage, instead of forcing people to navigate all over the site. You can use the theme for business, corporate websites or just to showcase videos and products. Onetake is a professional theme with features that you usually only find in premium themes. The theme includes all the essential features you need to create an awesome and beautiful website and online presence. A striking feature is the full screen background with video support from YouTube and Vimeo. Ensuring that it is easy to create great looking video backgrounds with awesome slides effects. Once you are done with its creation, the theme promises to look perfect in all browsers, mobile phones, tablets and computers. In addition, you can create your own personal blog to improve how your site is seen in the eyes of the search engines. Along with the translation features, several impressive colour options and threaded comments for talking to your customers, the Onetake theme has everything it takes to support an informational website for just about any type of business. The aptly named OnePager is a good choice if you need a portfolio or business site theme solution that’s traditional but still wholly modern with its one-page style. With its responsive HTML5 theme that offers an image slider up top and an image gallery with popup support, so you can easily highlight your best projects. OnePager has an in-built PHP contact form, social media icons, and “circular knobs” for showing off your skills. Simple, familiar, yet wholly original, just how you would like it. It is simply beautiful and beautifully simple. These are words that will come to the mind of anyone that lays their eyes on Onesie by Graph Paper Press for the first time. It is a simple theme that could be used by professionals to build a quick personal portfolio website. It adapts to the screen size of iPhones, iPads and other mobile devices. This slick one-page theme is absolutely perfect for a simple portfolio, barebones business site, or event site. Its landing page style that gets your visitors to where they want to go easily and quickly, without any extra parts cluttering things up. Honestly, nothing extra is added here. It doesn’t display posts, pages, custom sidebars, widgets, or menus. It’s one page and that’s what’s great about it. Onesie offers some customization options, however. You can add a company logo or background image, set a background colour, add a header image and favicon, select your fonts, and more. That’s all. This theme was built for law firms. It makes it simple to create an inspiring online presence that perfectly captures what you and your business stand for. You can customize the homepage easily to reflect your firm and the services you offer thanks to the many available front-page blocks. Quill provides a high level of customization options, which include a full-width slider, a responsive layout, social icons, a custom header, a robust theme options panel, animations, a multitude of custom widgets, and more. You also get a parallax background, custom scroller, Font Awesome Icons, and a widgetized footer. Moesia by aThemes is a great choice for you if you are looking for a business theme that captures attention. By business, I mean any kind of company that requires a strong visual presence that remains professional and sophisticated. With Moesia you can choose from eleven predefined blocks and build the homepage that best suits your company. Each homepage block can have a parallax background image and its own set of colours. The theme is fully responsive and offers a plethora of features. Other features include a custom header, custom widgets, and a theme option panel. Solio by MediaLoot depicts how portfolios and one page themes are a perfect pairing. Solio offers all the key things a professional wants to pass across at first glance. Easy contact options at the top, easy access to previous work, pricing, just name it — if it’s relevant to professionals who need to showcase their work, this theme is a perfect fit. A fantastic feature is the ability to mark yourself as “Available” or “Not Available” as your work schedule allows. It also has a lightbox viewer, filterable gallery, and pricing tables that make it easy to show what your services are worth. The eVision Corporate theme as the name suggests is a strong and attractive single page business / corporate theme. It has been introduced after long research and analysis. It looks wonderful on all devices and produces an attractive and strong business presence. It is suitable for any type of business or organization and has features such as featured slider, services, portfolios, testimonials, skills, google map, contact section etc. with the enable/disable option from the customizer setting. It also includes support for one page sites being fully responsive in all devices like iPhone, iPad, Android etc. Its competencies include fluid layout, bootstrap, HTML5, CSS3, retina ready, font awesome, Google font to make your typography choices look stunning, cross-browser compatibility, colour control, layout control, logo upload, translation-ready, custom CSS field works nicely for those with a little more development knowledge. The portfolio is easy to manage from the backend, and it has a few filter options for guiding users through the process. Translation features are provided, helping those who may not speak your language, and the threaded comments are prepped and ready to create conversations between you and your readers. The One Paze theme is a beautifully designed modern WordPress theme. It offers a multipurpose design interface, using a fullscreen slider at the top of the site to grab attention and incorporate text that explains the type of services provided. Everything is based on an individual page, clearing out the clutter and helping people move around on a digital platform. The responsive design helps with viewing on mobile devices, and the backend customizer works wonders for changing colours, logos, sliders, footers and more. It loads superfast, it is built with a customizer and allows you to live preview your changes as you go. A blog is available for talking about upcoming events, products or tools, while the three menu layouts give you the flexibility to keep your customers informed about where to go next on your site. You can generate a quick favicon directly through your dashboard, and use the portfolio area to reveal your most recent projects. A number of call to action modules are provided throughout the one page design, enabling you to send people to other pages, while also giving them a clean parallax effect as they scroll through. Starter has a great look that’s perfect for portfolio sites. Developed by ShapeBootstrap, this one-page theme is easy to navigate and looks easy on the eye on desktops, tablets, and smartphones. It also features nice post types like slider, projects, clients, and team, so you can easily showcase your previous clients, your best work, and your valued team members in a spontaneous way. Other features included in this theme are; smooth scrolling, a parallax background, a variety of theme options, Google Fonts and detailed documentation so you can make tweaks as you see fit. It’s a clean and modern theme that is best suited for landing pages and showcasing your latest iPhone apps. If you’re thinking about selling an iPhone app, then this theme is just perfect for you. Appz by Themeshaker is a one-pager with some personality. It was designed specifically for those looking to sell iPhone apps. Meaning it has all the sections and features you’d otherwise need to setup yourself, pre-installed and ready to go. Appz’s landing page style makes it ideal for setting up the pitch for your app. It’s got an elegant, modern design and even comes with the design files so that you can customize them to fit your brand. Other features include; content slider built using bxSlider with a little help from Timthumb for cropping and resizing images; numerous styling options which allow you to choose a different font for the logo, pick a different accent colour or change the background image of the header with a click of the mouse button; localization support for easy translation and so much more. Intro has a nice layout and includes a variety of interactive components. It is another offering from aThemes that truly stands out. Filled with animated mouse-over effects and parallax support, the website seems to come alive on its own when scrolling through the page. Intro is the perfect theme for modern businesses and works well for companies seeking to create a web presence that is both aesthetically pleasing and functional. It’s responsive, comes with the added benefit of a theme options panel, a parallax header, and social icons. The developers stick with the best practices from WordPress to ensure the system remains stable and efficient. What really makes Intro an outstanding theme is the inclusion of front page blocks that make it easy to customize content with minimal fuss. Include your own content or third-party widget content if you want in these areas. Intro also comes with a live customizer and is supported by the most browsers. What sets it aside from many other themes is the inclusion of Google Fonts. This means you have access to more than 600 ways to change the typography of your text. Minimable is a quite appealing WordPress theme designed to provide a stunning and dynamic look to your project. This lovely theme developed by Fedeweb is a highly scrollable one page dynamo with some serious class. The name comes from the combination of minimal and scrollable, two elements this theme handles with perfection. Animations work when scrolling in and out of sections, while the circles located at the start let you jump around the site. You can easily feature your staff on a dedicated team section. Your gallery can appear as round images to be clicked for a closer look. It comes pre-stocked with portfolio, contact, and custom pages to do with as you please. You are free to customize the colour scheme to meet your brand. It’s built with Bootstrap, sports a really responsive layout, and Superscrollorama, this means the scrolling effects are going to be off the chains. It is a stylish and trendy multi-purpose WordPress theme that makes it possible for you to construct any kind of website that you can realistically imagine. Limo is really versatile. It can fit into any type of brand and company: photographers, freelancers, designers, entrepreneurs, web studios and other artistic agencies. The Limo theme is just right for you if you’re interested in a one page solution with lazy loading and smooth scrolling. Limo is fully responsive for showing up on smaller devices, and it comes with a responsive carousel slider for you to showcase your products and services in style. Awesome Font icons are provided, making your site a bit more visual, and Contact Form 7 can be easily used to integrate a map to your customers. The dynamic portfolio gallery runs really smoothly, enabling you to upload images and older workpieces you can use to impress potential clients. On the plus side, an editable pricing table comes packaged with the Limo theme, revealing an outline of what customers pay for when they choose your services.